We love Special projects and especially the process of working with our clients to develop, manage, and produce them. Examples of special projects: A Fortune 500 Staffing Services company needed to develop a way to present it's annual salary guide. 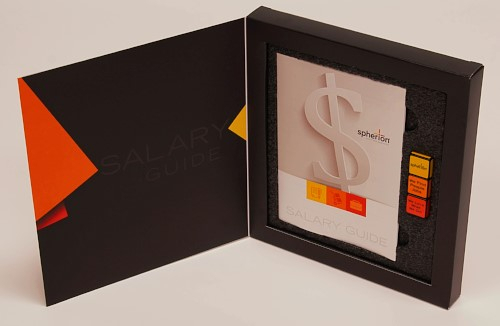 When meeting with the marketing department, we learned that the salary guide information needed to be burned onto a thumbdrive. The drives had already been purchased from an overseas vendor. There would also need to be a printed instruction guide to go along with the thumbdrive. Otherwise, that was it. Solution: We brainstormed and came up with the concept of a custom printed box with a diecut foam insert. Working with the clients graphic design team, we came up with a great design for the box. Once the design was approved, the box was printed, diecut, glued and folded. We sourced the foam through a midwest manufacturer and sourced the burning of the data onto the thumbdrives from a midwest IT Services company. When the components were completed, the items were shipped to our kitting facility where everything was put together. Each box was shrink-wrapped and placed into a shipping container that held 50 custom salary guide kits. The custom boxes were then shipped to 132 offices across the United States. Outcome: Success! Not only did the marketing department staff love the final product, the offices where they were shipped did so as well.